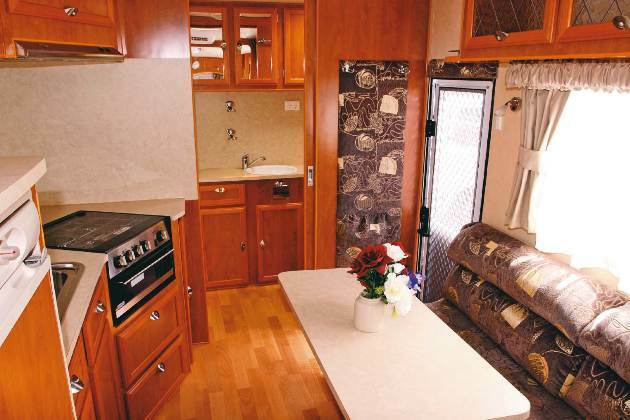 A company name like Royal Flair might imply that this Melbourne-based operation caters only for the extremely well-heeled, but its caravan range is relevant to all budgets. A good example is the mid-range Designer Series featured here. Priced at $50,840 as reviewed, it represents good value, especially when considering its attractive external looks and appealing standard equipment. The Designer Series comes in four different layouts for customers to decide what may suit best, and Bill at Royal Flair is happy to discuss custom ideas. Adelaide Caravan Specialists is one of SA’s Royal Flair dealerships, and the company was kind enough to lend us a Designer Series van for review. At 6.4m (21ft) long and with a Tare weight of just under 2000kg, it isn’t a giant van and is therefore suited to a larger range of tow vehicles. The construction is fairly conventional using a new lightweight SupaGal chassis, load-sharing leaf spring suspension, 2in heavy-duty axles and attractive 14in light truck alloy wheels. Up the front, the drawbar features a pair of 4.5kg gas cylinders and a centre jockey wheel. Out the back is a good, solid, looped bumper bar with a spare wheel. All in all you’re looking at a total length of 7.92m (26ft). The van looks good with large poly plastic windows, classy colour scheme and full wrap-around checkerplating. An A&E awning 8300 comes as standard, and the external speakers are an appreciated addition. There’s also a Swift slide-out barbecue and an external picnic table. Other useful accessories include the generous checkerplated stoneguard, external LED lights, pair of 95L water tanks and the external powerpoint. As you enter the van, you’re greeted by a material-backed wall with hangers for coats and hats – a small touch, but appreciated nonetheless. The dinette is very comfy to sit on. The table is a good size and can be lowered or removed, but you’ll probably need it when you’re preparing food as there isn’t a huge amount of benchtop. The cooktop itself is a Spinflo Minigrill with one electric and three gas hobs, but some culinary experts may prefer a larger cooker. The same can be said for the Thetford fridge, though at 164L, it should be fine for a couple. A Sanyo microwave sits attractively flush with the wooden cabinets and is located just above the fridge. Around the kitchen area is ample storage, all at levels that are easy to access. The bedroom adjoins the main living area and is a comfortable place to be. The queen-size bed is easy enough to navigate around. There are mirrored wardrobes and a few drawers either side of the bed, and there’s a full length wardrobe with dressing table provided as well. A swivelling TV bracket is located in the bedroom to hold the included 15in LCD TV, and this can be rotated around for lounge viewing also. To my mind, the biggest success in the Designer Series is the generous bathroom area. It is well separated from the rest of the van thanks to a sliding door, offers excellent space for using the toilet, and storing things is easy thanks to ample cupboard space. 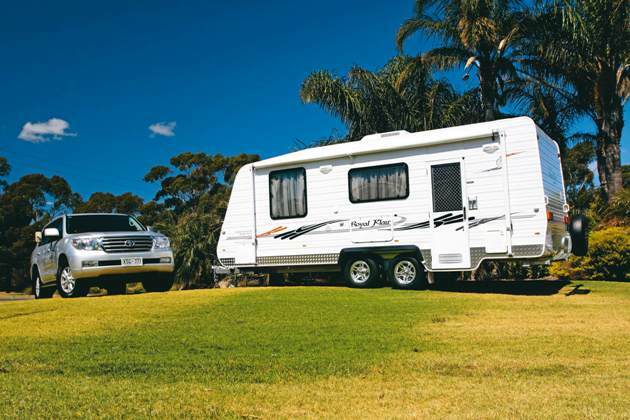 The Royal Flair Designer Series won’t break the bank and is great for an extended holiday or even a good few months on the road, and at less than 2000kg Tare, it can be towed by a large number of vehicles. You won’t find the likes of solar panels or the finest furniture money can buy, but what you do get is a van for around $50,000 that should cater for nearly all your needs. Read the full review in the February issue of Caravan World, on sale now!